If you had diabetes, you wouldn’t worry about telling people you were on insulin – but why is it that we’re afraid to tell people we’re taking antidepressants? Is it because we’re worried we’ll be seen as weak, fragile, even stupid? And in a church, will we be told we don’t have enough faith; that we need to pray or study the Bible more? Some people have indeed received responses like this – as if it had not occurred to them to pray about the distress they were in! Yet the reality is that for these people, medication was what saved their lives. It held their families together; it allowed them to keep their jobs; it kept them sane (sometimes literally). Medication does have its problems. There are side effects, some of which are significant. It doesn’t help in some areas, nor indeed is it the full answer to any mental health problem. It can ‘blunt’ the emotions, meaning we perhaps at times could do more wrestling and searching. It can be overused to treat unhappiness, low self-esteem and the ‘issues of life’. However, the lessons of history are clear testimony to the benefit of medication for severe mental illness. Until the middle part of the 19th century, huge numbers of people needed psychiatric inpatient care. In 1951, a medication called chlorpromazine was first used, bringing health and sanity to thousands. Some people say that psychiatric medication is not all that effective – and perhaps it’s not for mild or moderate illness – but you should have seen what things were like before it was invented. We know that over 50% of people with severe depression will get significantly better with an antidepressant. The remaining 50% can usually get some benefit with other medications. Over 70% of people with psychosis or schizophrenia will benefit significantly from antipsychotic medication. The remaining 30% will benefit in part, and would be extremely unwell with no medication. The fact that there are medicines for mental illness also allows people to take time off work, receive help and benefits, and be properly regarded as ‘ill’ instead of lazy. Only a very small minority of people abuse this sick role and its permissions. The vast majority of people with mental illness need this support – either for a time or longterm. There are four main types of psychiatric medications listed in the British National Formulary. 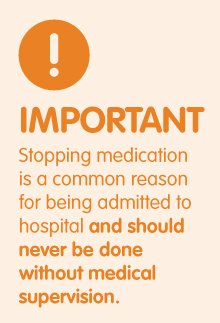 You can read more about individual medications on the Choice and Medication website. Antipsychotics. These medicines mainly reduce a neurotransmitter called dopamine in the frontal lobes of the brain. Dopamine is overactive in psychotic illnesses like schizophrenia. Antidepressants. These mainly raise the levels of a chemical called serotonin, which is lowered in severe depression. Mood stabilisers. These are treatments for bipolar affective disorder (though antipsychotics are effective here too). They include lithium, and some other medications also licensed for epilepsy. Their method of action is not well understood. Hypnotics and anxiolytics. These include benzodiazepines, ‘Z-drugs’ and a range of other sedating medicines. They do not treat active illness, but can help with symptoms in the shortterm, since the medications above can take some weeks to act. Sleeping tablets should not be taken longterm. There are other smaller groups – medications for dementia, attention deficit disorder and substance misuse/dependence. Would you take these medications? Sometimes Christians can be nervous about taking medication that acts on the brain because they think that is the organ where their ‘faith’ lives. The brain may be where we construct thoughts about God, where we process the Bible words. But our faith is bigger than our skulls, and our understanding of the Bible is bigger than reading words. Anyway, we typically have no problem taking other ‘psycho-active’ medications. Would you take paracetamol for pain? Well, that acts on the central nervous system to change how the painful part of the body is seen by the brain. Would you take anti-epileptic medication for seizures? Well, that definitely acts on the brain! And seizures get far more spiritual attention in the Bible than mental illness. Would you take chemotherapy? That can have severe side-effects (worse than psychiatric medication) but is taken because it can save lives. And so do antidepressants and antipsychotics. Medication is not perfect: not everyone responds; not all the symptoms go. One analogy is to think of it like scaffolding on a building. It can ‘hold things up’ while some further construction (such as talking treatments or lifestyle changes) takes place. Of course, the analogy is not perfect, as some people may need to continue to take medications longterm. There’s no shame in this – it just means that they have a particular form of illness. Medication is part of the treatment of mental illness – and sits well alongside faith and healing as part of a holistic model of health and wellness. One day we will all be perfectly healthy, but on this earth there are a number of ways of healing that can act together and in different ways. God has given us doctors and scientists, and he has given us medication to use wisely and well.